We finally got to go camping this past long weekend in Ontario. 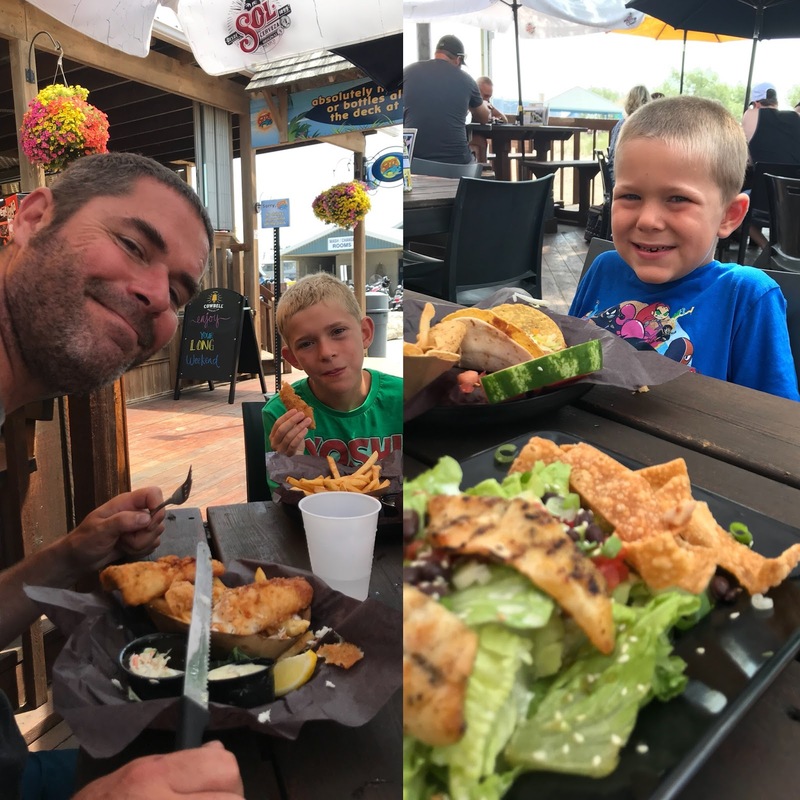 It has been a crazy busy summer as far as weekends go but luckily, although I left a little late, I was able to locate a great conservation area that we were able to enjoy in the lovely Southwest Ontario! Lake Whittaker was where we ended up and it is a great weekend spot. It is only 30-40 minutes away from the lovely Port Stanley that sits on Lake Erie and about 10 min away from the town Aylmer. Not too far from another cute town St Thomas. All these areas have nice spots for day trips. We only managed to to visit a few as we took in and enjoyed some of the offerings at the conservation area itself. For example, at Lake Whittaker Conservation Area in Southwest Ontario I was quite surprised to see all the events and extras they do every weekend in the summer. When you pull in after registration, there is a board posted with all the different activities going on all summer. While we were camping there we were lucky enough to partake in the carnival they had set up in the pavilion area right beside our campsite. The had a bunch of games (including a dunk tank!) where if you won you would receive raffle tickets for some great prizes! We were lucky to win a couple. There is all sorts of camping sites available, no hook ups off the lake, 15 amp in woods or 30 amps are by pool. They also have seasonal sites and a pool there which isn't as common with conservation areas. Playground, basket ball court and volley nets. There was great fishing in the lake for both kids and adults. 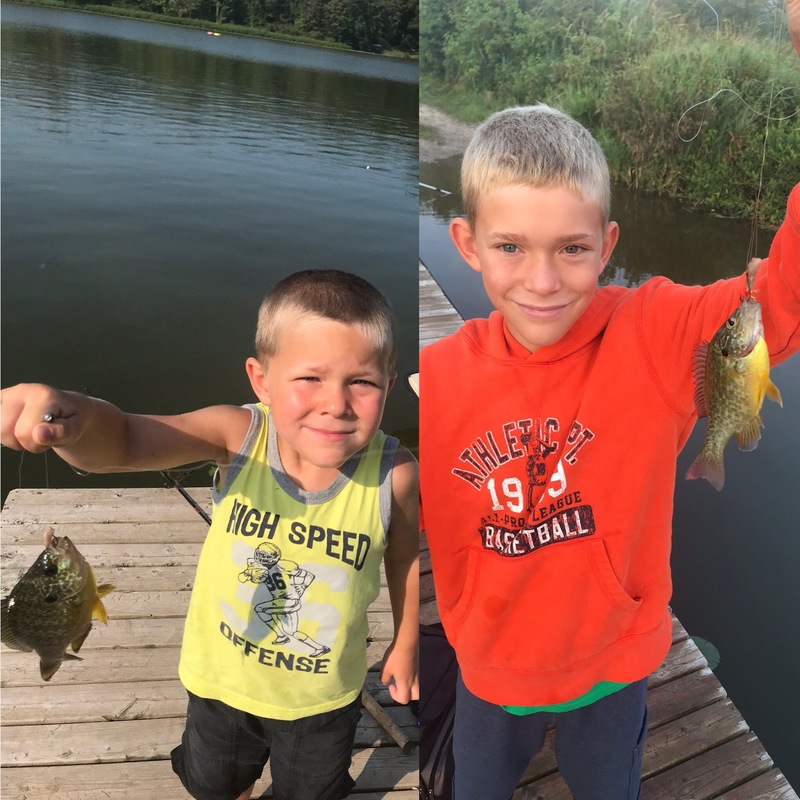 Kevin caught a couple of Large mouth bass of decent size and the kids were happy to catch decent size sunfish! Liam caught 7 one morning! Of course every night there was a camp fire and out came the marshmallows and my favourite for s'mores is the chocolate covered cookie (Leclerc Celebration cookie for easy version). The kids loved them and are a necessary part of every camping trip now. When I found this campground and saw how close it was to Port Stanley, I knew we would be having a beach day and would spend the day in this lovely town in Southwest Ontario. We once stopped through on our way to Michigan and love this beach and proximity. It is much easier for us to navigate the traffic on the West then from the North or East being off the west side of Toronto. It is a doable day trip. In fact one great thing about the camping at Lake Whittaker is that it's under 90 min away! Since Port Stanley was only around 30 min away from our camping site, we were able to hit the beach right after breakfast. We got to the parking lot at about 10am and though we found great parking with ease people were all arriving at the same time. It got busy quick for the super hot day that brought humidex to over 40'C! Great beach day! The beach is sandy and shallow. The best feature for the kids though was the waves! They were having a blast diving into the waves. It got windier towards the afternoon. The beach isn't huge but it is very nice and there is at least 4 life guard posts with 2 on each plus ones patrolling ground. If waves aren't your thing, there is a quiet beach on the other side of the breaker called the family beach. There is a boardwalk from main beach through to town along water and a lift bridge as well which is kind of neat for the kids. The smaller beach is on the other side of town and if you get there early enough there is free parking up by it in the grassy knolls. We had an amazing lunch at GT's on The Beach restaurant that is on the beach by the Volleyball nets, up from rest/change rooms. They have local fresh perch and walleye served there and my perch salad was amazing. Kids menu was pretty unique, Logan had a taco which was chicken and served with hard and soft shells held together with re fried beans and the prices were fair. It is all patio set up but with lots of shade. If you want to eat here though, I suggest you get there early if a busy day at beach because it gets busy quick too. After lunch we went to beach for a bit more and then decided to try some ice cream in town. We took a stroll over the bridge and headed to Broderick's Ice Cream Parlour. There was tons of flavours of ice cream to choose from. I had some pistachio, my favourite. Niagara Peach was a winner too but the biggest draw was there in house made waffle cones and rightfully so. The best thing was they had toddler size of the cones which is my size of ice cream. Just the right amount and I got to enjoy the cone and ice cream, win win! Did I mention how hot it was! It was a parching walk and on the way back we passed another location that is hard to miss. Mackie's is another restaurant off the beach. Quite another popular place and I had heard of these Orangeade drinks. Well we just had to stop dying of thirst as is, it was a perfect opportunity to try one. Boy, we were glad we did! It was like a refreshing creamsicle. There were other things of interest there. There was a train tour right across the lift bridge and it as about hour long tour. We were walking past around last run and didn't get a chance to do this trip. Another place of interest with kids is the Honey Farm in Aylmer, called Clovermead Adventure Farm. It looked amazing from the road. It would be a good half day visit, there seemed lots to do and the parking lots were full. I would like to make a trip back in the area to take kids to this farm. Speaking of farms, there is a lot of markets, stands and farms you can pick your own or ready picked. We stopped at Berry Hill Fruit farm before heading home and there was amazing assortment all grown there and picked that day! Thanks Kate for taking the time to comment. It looks very lovely and so full of nature where you are on the other side of the world! You have to try camping! Start out at a spot close by for one night so it's less stressful if things don't work to plan.